During study breaks I have found myself watching some of my favorite professional wrestling matches from yesteryear. That's right, I used to be a BIG fan of professional wrestling. I first became a fan of the WWF when I was a kid, with Hulk Hogan (not surprisingly) and the Ultimate Warrior being my favorite wrestlers. Over the years, I lost interest until the summer of 1996 when I happened to be over someone's house who was watching a WWF pay-per-view event. It peaked my interest again and I began watching just at the time that wrestling was hitting it's most creative and popular era 1996-2001; where the WWF, WCW, and even ECW competed with each other to provide the best stories and matches in wrestling history. Although I no longer watch wrestling (except checking in maybe once a year to see what's happening at WrestleMania), I still find myself returning to my favorite moments and matches of yesteryear. I find that the best wrestlers are true athletes and true artists. Their canvas is in a wrestling ring and their colors are made up of promos, humor, psychology, drama, athleticism, technical ability, risk, and violence. When put skilfully together by a great wrestler, these colors can create masterpieces As with anything I take an interest in, I've decided to rank these masterpieces. What follows are ten of my favorite wrestling matches of all-time (along with ten honorable mentions). In all, these matches represent what I find to be the best representative presentation of what I think is the best wrestling has to offer.If you've never seen any wrestling before, than I recommend you check out the top 2 matches on my list as an introduction. If you are a wrestling fan, feel free to share your favorite matches and moments! Enjoy. 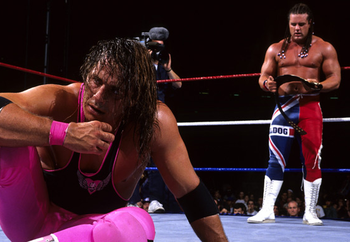 Commentary: Bret "The Hitman" Hart and Mr. Perfect (Curt Henning) had some of the best all-around wrestling matches in the early days of the WWF (see also their King of the Ring 1993 match). Their series of matches featured great technical wrestling while being able to deliver a story of clashing egos. Commentary: Both men had better matches with other opponents, but this is their best one-on-one bout. Two of wrestling's best (and biggest egos) spend 60 minutes putting on a clinic of wrestling moves. With the distance of time, it's a better match than most people remember. 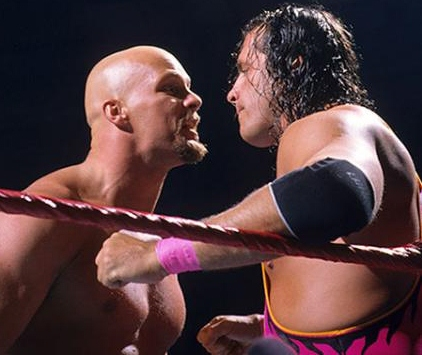 Commentary: This match came in the midst of Stone Cold's mega-popularity. The match itself is fantastic, but it also stands as a great representative of many of the best WWF Attitude Era components: Stone Cold vs. Vince McMahon at it's peak, Mick Foley showing his comedic genius as Dude Love, interference that makes sense, and at the center of it all, great wrestling. Commentary: This will forever be one of the hardest matches to judge, as it includes several of the most heart-stopping "Oh My God" moments in wrestling history, but it isn't really a great "match". 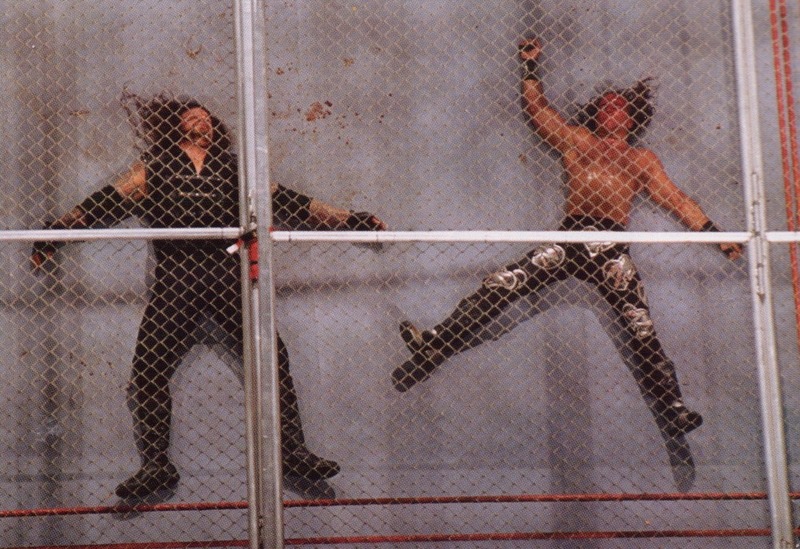 At the beginning of the match, Mankind (Mick Foley) takes two bumps off the top of the cage that terribly injure him. Though these moments are exciting, the rest of the match (another 10-20 minutes) is a slow and painful watch as Mankind lumbers around the ring in obvious pain. For that reason, I can't include it in my Top Ten. Commentary: If you are looking for pure athleticism and wrestling ability, than go no further than this match. 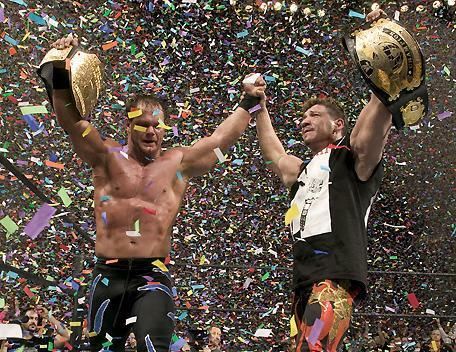 I don't think anyone has equaled the in-ring chemistry, creativity, and work rate these two men had. The only reason it doesn't rank higher on the list is because the ending is a bit of a let-down and their in-ring chemistry is SO good, that it can take on too much of a rehearsed nature at times. Commentary: In the beginning of the year 2000, Triple H and Cactus Jack (Mick Foley) had one of my favorite feuds of all time. Their street fight in Madison Square Garden is a brutal affair with incredible in-ring psychology and storytelling. Commentary: This "Hell in a Cell" match is often overlooked because Foley doesn't do anything as dangerous as the bumps he took in the match against the Undertaker. However, this match is much better paced, a better story and still contains some of the most brutal moments in WWE history. It's the second best Hell in a Cell match in WWE history. 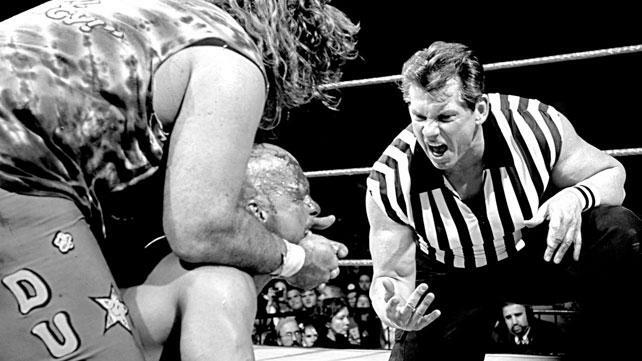 Commentary: This was my favorite match of all-time for many years. Benoit and Angle are two of wrestling's greatest pure wrestlers (Angle won a gold at the Summer Olympics in Atlanta) and they provide their best one-on-one bout here. It's a great back and forth match featuring several submission holds and their reversals. It doesn't rank higher because of its lack of better spots and the fact both men would go on to have better matches. Commentary: This is the closest I've seen the WWE Championship coming to have a true "Prize Fight" feel to it. Both these men are legit strongmen, legit wrestlers, and legit tough guys The match is a great back and forth spectacle of entertainment and athleticism. Commentary: A beautiful and compelling match that many consider to be the greatest wrestling match of all-time. They might be right, but I don't think it's even the best Michaels vs. Undertaker match. The only thing holding this match back from being in the Top Ten is that it features less legit wresting than other matches I prefer. Commentary: I love Ric Flair and consider him to be one of the greatest wrestlers of all-time. My favorite Ric Flair match comes from his performance in the 1992 Royal Rumble Match. Flair had just come into the WWF at the time and for the first time the Rumble match was for the WWF Championship. Entering in as contestant 3 out of 30, Flair lasts the entire match to win it. The entire Heel Flair repertoire is on display here: the phantom hand shake, the Flair strut, the low blows, eye gouging, the cowardly begging, and the patented Flair face plant flop. 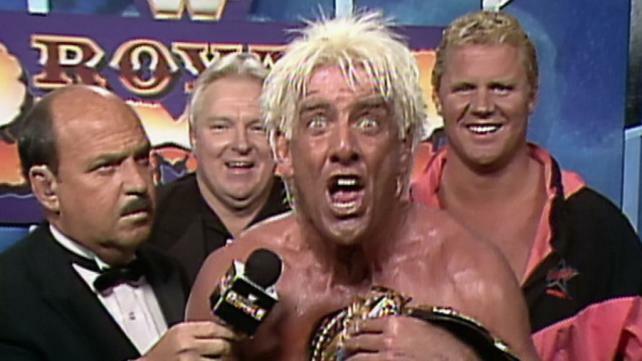 Illuminating Flair's heel masterpiece is the incredible commentary by Bobby Heenan who is completely in Flair's camp. Commentary: Perhaps my favorite feud of all-time is between The Rock and Mankind. 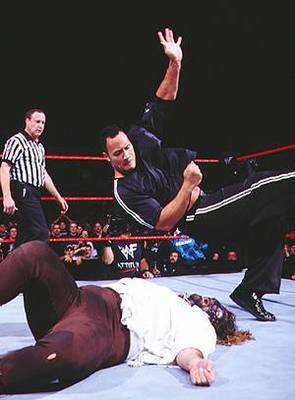 They feuded between 1998-1999 at the height of Mankind being a babyface and The Rock being a heel. They provided many of my favorite promo's and television moments. Out of their series of matches, I think the Royal Rumble "I Quit" match is their masterpiece. It features all the great humor (The Rock on the announcer's headset, Mr. Socko, etc. ), but also told story of the Rock's willingness to go to great lengths to win the title and Mankind's willingness to take a beating to keep it. It's a truthfully brutal match to watch (Mankind takes 15 chair shots) and is a perfect illustration of a wrestling match that could be humorous, athletic, tragic, and still have the eerie feeling of being more real than we give it credit. Commentary: The atmosphere of Wembley Stadium, the international appeal of the opponents, and the awesome back and forth wrestling combine to produce a truly great match. 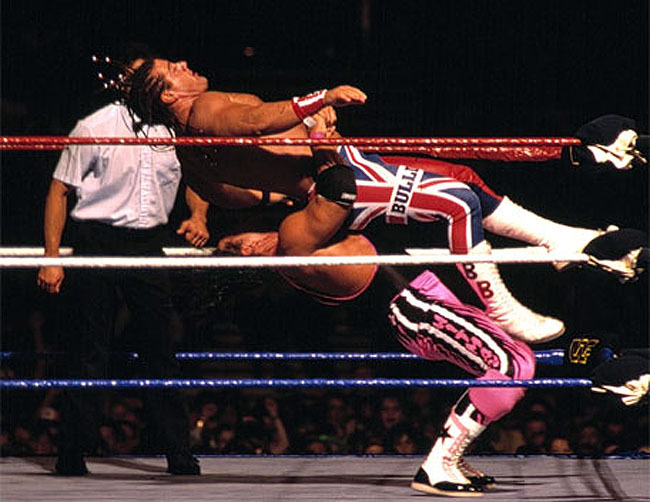 I consider this match to be Bret Hart's best pure singles match and the greatest example of his style of wrestling: good in-ring psychology, heavy emphasis on technical wrestling, inclusion of several well placed high spots and bumps, with a couple near fall finishes that can come from a finisher or a surprise roll-up. Commentary: The first and the best "Hell in a Cell" match. Many forget that the cell was only introduced to in order to keep away outside interference and to force the two opponents to have to fight each other. Michaels and Taker have an incredibly brutal back and forth in the first 2/3rds of the match until a well-developed moment that allowed them to get outside the cage. The last third of the fight takes place around and on top of the cage, climaxing with a Michaels bump off of the cage into an announcer's table. The fight took place during a time in Michael's career where he was at his peak athletically and as a heel. The story of the match perfectly ends with Kane's first appearance allowing a depleted (from a wicked chair shot) and bloodied Michael's to get the win. Commentary: The best pure (no gimmicks involved) tag match in wrestling history. The chemistry and work rate are all top-notch, and the dramatic finish is historic. 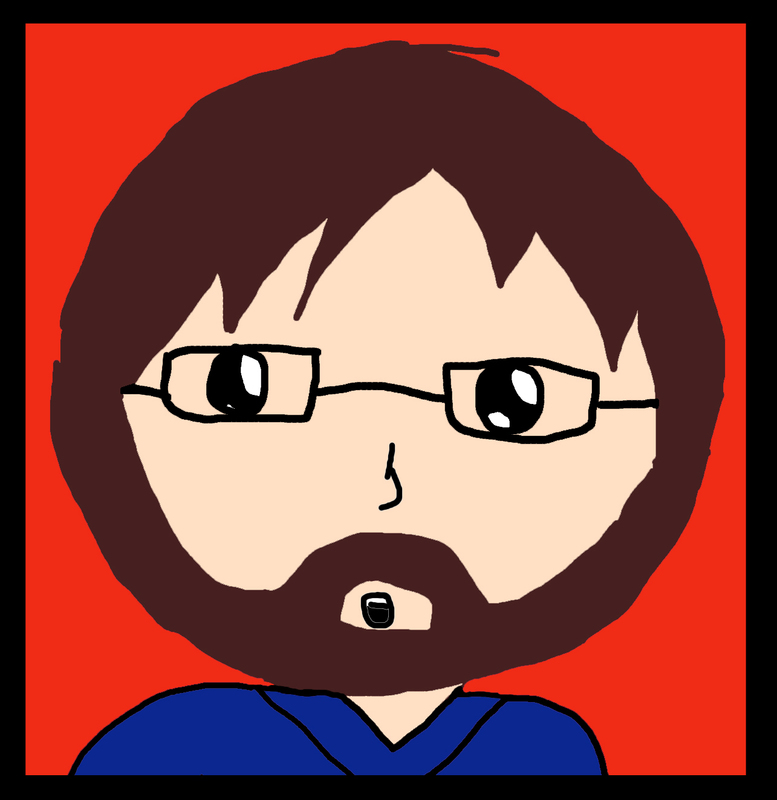 It's a shame I couldn't include this in the Top Five. Commentary: My favorite cruiserweight match of all-time and the only WCW match to make my list. The perfect combination of believable storytelling mixed with traditional wrestling and the high-flying lucha libre style that only the cruiserweights can provide. Commentary: Tables, Ladders, and Chairs match at it's absolute best. 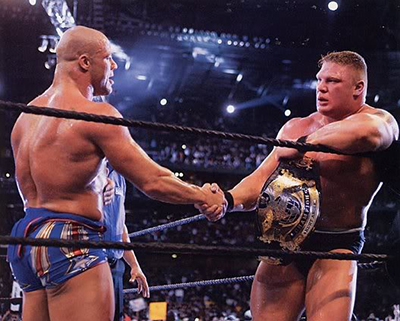 The gimmick is overused today, but when this match took place in 2001, it still felt fresh. The match is perfectly scripted with the just the right mixture of medium to epic sized bumps that makes a memorable match. The multiple teams and ring interference add the right amount of drama and action without diminishing the match itself. 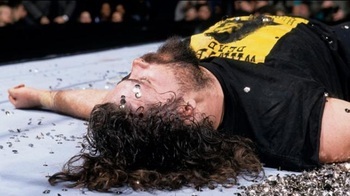 Commentary: The most intense wrestling match I've ever seen and the defining match (and image) of the Attitude Era. 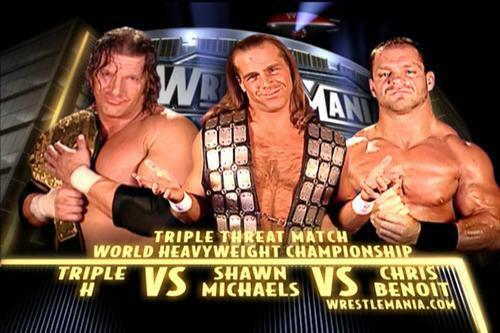 Commentary: The best triple threat match of all-time and quite possibly the best match of all-time. If it wasn't for my number one match, I would use this match as the official ambassador of professional wrestling to those who have never seen a match. Commentary: If I was given only one opportunity to show someone the virtues of professional wrestling, I would show this match. It is the closest to perfect that I can think of. The match contains just the right mixture of mat wrestling, submission moves, reversals, big bumps, finishers, and in-ring psychology. There are no gimmicks, no interference, and no titles on the line. It's simply two of the greatest wrestlers of all-time producing a thrilling wrestling match on the biggest stage of them all, WrestleMania. If you've read this far into the list and have never seen a wrestling match, make this the one!